The Taj Mahal is a mausoleum built by the Mughal Emperor Shah Jahan in memory of his third wife Mumtaz Mahal. 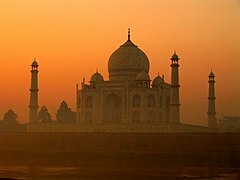 It is built from white marble and is located in the city of Agra, India. This page was last edited on 8 January 2019, at 02:44.